Fortunately it's still easy to get lost in Beijing. From the center, which harbors a labyrinthine imperial palace with a fabled 9,999-rooms, the old capital rambles in a maze of narrow alleys that can be as befuddling as they are charming, with their secret gardens, endless detours, dead ends and sometimes maddening lack of orienting landmarks. Many of the hutong – those that remain, that haven't yet been turned into shopping strips – look so identical and are so secluded from large buildings that they can feel like anywhere in Old Beijing, at almost anytime in history. Not knowing exactly where you are or what street you'll end up on is part of the ancient city's delight. But as one city was dawdling and wandering in the hutong, another city was preparing for its biggest event ever. Even decades before the Olympic bunting went up and the buildings came down, New Beijing had the triumphal architecture and collectivist spirit, the security machine and love for spectacle that are the necessary ingredients for a grand international gathering. The city's ancient south-north axis is a perfect showpiece for the Games, sprouting the Olympic Green and getting a major face-lift under the auspices of Albert Speer, Jr. (the son of the man who reshaped Berlin for the 1936 Olympics). And then there's the general ambition, parallel to that of the Olympics themselves, not only to rally national spirit, but to spark development, investment and international connections on an unprecedented scale. Just as intense as the most heated track finals will be the race for foreign and local businessmen to forge billion-yuan deals that will continue to remake the city and the country. Even the Games' motto, "Citius, Altius, Fortius," or "Faster Higher Stronger," seems to describe this country better than any other Olympic host, and better than all of the other Olympic slogans plastered around the city. It is impossible to know how things might have turned out differently if, say, the Olympic Committee had said "Paris" instead of "Beijing." It was one of Beijing's main competitors, the "most romantic" city in the world, that set the modern standards for Olympic-sized urban renovations. The Baron Haussmann called for untold numbers of the French capital's small alleys to be eviscerated in order to widen streets into massive, car-friendly boulevards that could also, if necessary, serve to make streets more accessible to soldiers and tanks. An inspiration to Mao's planners, Haussmann uprooted whole neighborhoods to bring the modern city to ferocious life, a transformation which might have become soul-crushing had Paris not retained the gorgeous, human-scale lanes that make it so charming and, boycotts aside, popular with Chinese tourists. Thanks to the inescapable countdown clocks, Beijing's own preparations have progressed with the tick-tick-tick suspense of a new millennium, a space rocket launch, or something more sinister. But the city was already keeping pace with another set of timepieces. Old buildings crumbled like hourglass sand, new subways coursed through the city's ramshackle circuitry like status bars for a new software installation, while civility campaigns and hygiene campaigns and tree-planting campaigns enforced international compatibility. Amidst the uneven upgrade of hardware and software, there was hand-wringing and fighting and crying, but mostly it all happened so quickly that there wasn't much time to consider what had been erased. Just time to get in (an orderly) line, move on (or move out to the suburbs), and stare slack-jawed at what replaced it all. And then keep moving. That's Beijing. But to what exactly is the West supposed to catch up? Yes, these buildings are spectacular, but next to the cozy scale of the hutong, their enormous scale, futuristic skins, steel acrobatics and sheer daring make them mostly just spectacular. To our mere early 21st century senses, they do not really compute. The egg and the water cube and the nest and the dragon and the big shorts/pants are convenient monikers for buildings that don't look like any other buildings, or any thing we've seen before. Dazzle and provoke they do, but these surreal buildings also come close to confusing and alienating. Amidst a forest of gated communities and mammoth highways, those are qualities that perhaps should be less of a priority. Could there really be a village where houses stand right beside each other covering the fields and reaching further than the view from our hills, with men standing shoulder to shoulder between these houses day and night? Rather than imagining such a city, it's easier for us to believe that Peking and its emperor are one, something like a cloud, peacefully moving along under the sun as the ages pass. 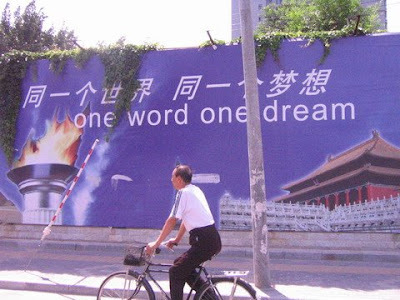 The posters ask us all to believe New Beijing is part of a similar pristine unity, one world, one dream. But what is this New Beijing, really? Was it decreed by the government and implemented by thousands of workers? Was it named by property developers and their wealthy clientele? Was it dreamt up by the media? In a city where things can so easily get lost, is it so hard to imagine something else? For a brief time, before the hyperbolic real estate billboards would be taken down and replaced with Olympics logos, a piece of scaffolding surrounding a construction site near the Central Business District offered an oracular take on one of Beijing's mantras. 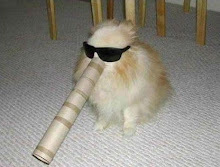 "One Word One Dream," it said. What must have been a typo, a pretty funny one, also seemed like an apt description of how Beijing would remake itself for its close-up and its continued growth: not just through wrecking balls and steel and glass and concrete but by a marshaling of words, by a state-sponsored, privately-owned or street-bound poetic imagination. Consider the names of buildings. If the nicknames given by citizens to Beijing's new architecture are signs of intimacy and a desire to make some sense of them, the names doled out by the real estate industry speak to middle class aspirations and a desire to make cents. Some luxury housing complexes and gated communities are simply bootlegs: Central Park, Upper East Side, Orange County (who knows what Regentland and Space Montage are meant to evoke). New words were added to Beijing's realty poetry by two shopping malls: at The Place and The Village one is hard pressed to find a sense of place or the feel of a village, not anymore at least. But the point is that how the city develops depends on how it is seen, and, more importantly, how it sees itself. "One Word One Dream" secretly an empowering idea, an Emersonian idea plopped into the Kafkaesque city. Beijing's future depends on the dreams – or the nightmares – of all its people, from the slogan makers to the slang-slingers. I asked Mike Meyer, the author of simply the best new book there is on Beijing, Last Days of Old Beijing, what kind of a city the world will see when it arrives for the Olympics. "The world will see the Beijing it wants to see," he said. "Cities are not jars of clay, but ever-changing rivers, open to multiple interpretations. I have 'my' Beijing, and you have yours." By the same token, Beijing will show the world what it wants to show it. Afterwards, others will continue to decide what Beijing is. Surely there will be more timelines and new slogans and big countdowns. But like so much else, these will probably get lost in the maze of worlds and words and dreams that make the city every day, and that count towards a place that is more than just "New."